until The Blessings of Nature is complete. Danica Pure-Spring is a Nord priestess of Kynareth living in Whiterun where she tends to the sick and wounded inside the Temple of Kynareth. She is the master trainer in Restoration, but will only offer training after you've completed her quest The Blessings of Nature. Recently, the legendary Gildergreen tree was struck by lightning and faded away, and with the Civil War raging, Danica has been forced to neglect her duties as priestess, including tending to the tree. Before the quest, Danica spends her mornings, from 7am to 1pm, sitting on one of the benches underneath the tree, trying to find someone to help her make the tree bloom again. She then spends the rest of her day healing the wounded soldier and sickly farmer inside the temple, and continues all through the night, at times conversing with her assistant Ahlam. During the quest, she patiently stays inside the temple until you return. This behavior continues after the quest is completed, due to a bug. 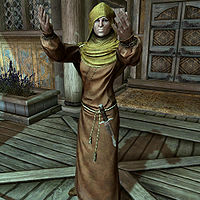 She wears hooded monk robes with boots and carries an iron dagger and a selection of lower-class items and gold. When asked if she is a priestess of Kynareth, she proudly claims: "Indeed. The temple here in the city is my charge. The goddess's divine blessings have no doubt helped make Whiterun a thriving and prosperous city. After all, it is she who brings rain to our crops and fair weather on the harvest days." She admits the Stormcloak uprising has changed her life when you ask her whether it has made an impact: "Somewhat, yes. At first it seemed a distant thing, heard only in the idle speech of guards and traders. When the wounded soldiers began to return from battle, I did what I could to help them. As more of the sick and injured came to the temple, my work as a healer became more important than my duties as a priestess. I wish only an end to the fighting, so that I can tend to the temple once more." When the quest The Blessings of Nature is completed she will start to greet you with: "Hello, child of Kynareth" and elaborate on her situation: "Lately it seems I am more nurse than priestess, tending to those who have suffered, both in mind and body, from this terrible war. These are trying times for us all, I know. 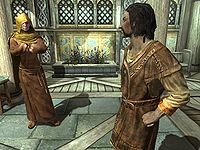 Many come to the Temple of Kynareth to pray, and I assist them as best I'm able." Danica also has an associate in Morthal named Idgrod the Younger, the sister of troubled child Joric. During the Delivery quest, Idgrod will ask you to deliver a note to Danica who has been treating Joric. When you hand the note to Danica she will respond: "Joric's sister? Poor child. Magic runs deep in that family's bloodline. It's not always a blessing. Thank you for this. Something for your trouble." With the Civil War raging, Danica has been forced to neglect one of her most sacred obligations to her goddess—tending the Gildergreen tree just outside the temple—because of the strain that the war is exerting on her primary obligation: caring for and comforting the sick and injured. As a result, the tree seems to have faded away and Danica needs a helping hand. She spends most of her time sitting underneath the tree, saying: "It's a shame, isn't it?" to people passing by. When you ask her about the tree, she will tell you about it: "This is the Gildergreen. It was planted as a seedling in the early years of Whiterun. Disciples of Kynareth could sense something holy in it, and traveled far to hear the winds of the goddess in its branches. They built the temple. Of course, not as many pilgrims these days." If you're not in the vicinity of the tree, she will instead remark: "The Gildergreen, yes. It's a bit of an eyesore at the moment. More of a problem for the pilgrims than for me, but not many of them around anymore." You can then ask her to elaborate on the missing pilgrims, to which she'll admit: "A big dead tree isn't very inspiring if you're coming to worship the divine of wind and rains. Kynareth gives life, and we need a living tree to be her symbol." When you ask her the tree's location, she will tell you about the Eldergleam: "To the east of here is a hidden grove where the Eldergleam resides. It's the oldest living thing in Skyrim. Maybe all of Tamriel. Our tree here in the city was grown from a cutting of that tree. You can still feel the glory of the mother tree through it." Alternatively, if you never heard the rumor about the tree from Hulda, she will provide even more background information: "It's an old tree. Very old. They say it was a seedling when the first men were arriving from Atmora, thousands of years ago. The sap is precious. It can restore barren fields or bring life to rocks. I can use it to repair the Gildergreen, so we can worship properly again." When asked if there is a way to revive the tree she will admit: "I've thought about that... Trees like this never really die. They only slumber. I think if we had some of the sap from the parent tree, we could wake up its child. But even if you could get to the Eldergleam, you couldn't tap it. Not with any normal metal." Once again, two options are available. Asking about the location of the Eldergleam will make her say: "If you want to help, you'll need something to cut into it first." Ask how to extract the sap and she'll mention Nettlebane: "Eldergleam is older than metal, from a time before men or elves. To even affect it, you have to tap into the old magic. You'll have to deal with the Hagravens. I've heard about a weapon they've made for sacrificing Spriggans. It's called "Nettlebane." The hags terrify me, or I would have gone after it myself." When you promise to get Nettlebane for her she will be grateful: "Your spirit is strong. Kynareth's winds will guide your path. It's held in a Hagraven nest called Orphan Rock." "I really don't have time to deal with you right now." When she sees you, she will ask: "So, have you gotten Nettlebane back from those filthy Hagravens yet?" When you tell her you have it, she'll be surprised: "Oh. I... well, I honestly didn't expect you to come back. Of course, I'm glad you did! Now... I don't really want to touch that thing, though. Do you think you could handle the next steps?" She will proceed to describe what must be done: "Eldergleam's sanctuary grove is to the east of here. You can use Nettlebane to retrieve some of its sap." You can then ask her why Nettlebane is needed, to which she'll respond: "The hags are hateful of anything which grows from the earth. They made the weapon strong against the natural world. It's the only thing I've even heard of that could cut Eldergleam. Stick it in, give it a twist, and the stuff will just flow out." 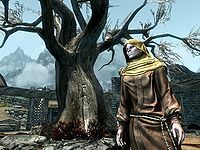 At the Eldergleam Sanctuary you have two possibilities; either extract the sap using Nettlebane or let Maurice Jondrelle create a sapling for you. She will be grateful if you've extracted the sap: "Wonderful. I'll use it to repair the tree. Thank you so much for all your help." The sapling, however, will render her exasperated: "But... I can't run the Temple without the support of people who are inspired by the Gildergreen. How can this little tree bring new worshippers?" If you tell her that it's not your problem, she'll realize: "You're right. It's mine. I may not live to see this little one grow into a new Gildergreen, but I can be remembered as the woman who planted it. I thank you. And may Kynareth's soft rains fall before you." Or you can explain what Maurice told you, specifically that renewal is more important than maintenance, to which she'll admit: "I... you're right of course. It can be hard to hear the winds of Kynareth when all you hear are the rabble in the temple. Death feeds new life. I'm sure that, in time, this little sapling will grow into a new Gildergreen that will tower over Whiterun. Thank you." All three options will end the quest and Danica will now be available as the master trainer in Restoration. Danica was supposed to sleep inside the temple every night between midnight and 7am (8am after the Gildergreen is restored), but her bed is slightly further away than her sleeping package allows her to go. As a result, she keeps tending to the patients all through the night.